So-So Beasts: The Distraction of Grindelwald’s Crazy Eyes. There, I’ve fixed the title to better reflect the film. Now, if only we could fix the film’s editing and throw in a few more characters to decrease Eddie Redmayne as Newt’s screen time, the movie could possibly live up to the “Fantastic” portion of its Fantastic Beasts: The Crimes of Grindelwald title. As it stands, there’s nothing magical about this second film of the planned series. There may have been a few slight missteps among the Harry Potter films, but nothing so dramatic it would be best to skip an installment altogether. That can’t be said of Fantastic Beasts: The Crimes of Grindelwald which feels like a series of disjointed events surrounded by some wild special effects and scrambled together into a two-hour running time. From the opening scenes of Grindelwald’s escape to later sequences involving the remainder of the main cast, it’s difficult to track who’s with who, who’s pretending to be aligned, and who we’re actually supposed to root for – with two exceptions. Always root for the platypus-looking creature and Dan Fogler as Jacob Kowalski. And, to a lesser extent, Alison Sudol as Jacob’s girlfriend is worth an emotional investment. The film follows Dumbledore and Newt on one side and Grindelwald on the other as they hunt for a young man named Credence. Credence, played mostly in full-on brooding mode by Ezra Miller, is also on the hunt, but his quest is to discover his real parents. Meanwhile, Newt’s brother, Theseus (Callum Turner), and his fiancée Leta Lestrange (Zoe Kravitz), are out to capture Grindelwald. There’s a whole backstory between Newt and Leta that’s sweet but rushed, yet not much is revealed about Newt and Theseus’ upbringing. 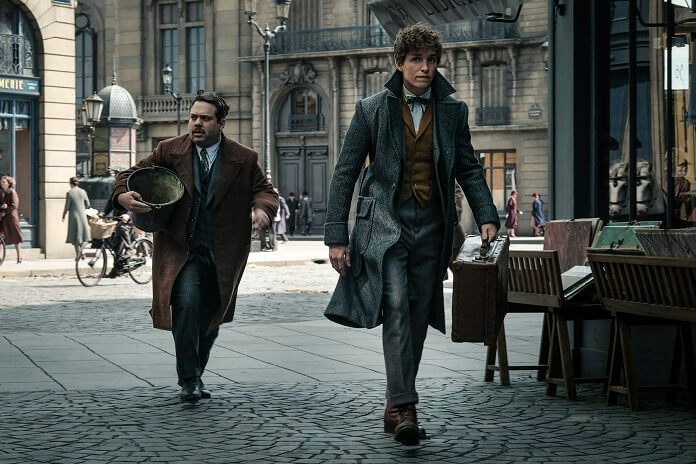 Newt, as it turns out, is the least interesting figure in Fantastic Beasts: The Crimes of Grindelwald. Theseus is slightly more interesting but he’s relegated to a few scattered appearances. Fantastic Beasts also introduces Credence’s friend Nagini, a Maledictus (a female who carries the blood curse) who transforms into a snake. The time spent in human form is slowly decreasing and she’ll ultimately become the hissing creature Harry Potter fans love to hate as one of Voldemort’s Horcruxes. In human form she’s not given much to do other than accompany Credence on his journey to discover his roots. Jude Law’s fine as Dumbledore and, yes, there is a secret confirmed that’s long been suspected but never addressed on film. As for Johnny Depp as Grindelwald, maybe it’s due to the fact he’s spent much of the last 20 years in weird getups, bizarre makeup and hairdos that his Grindelwald is more of a distraction than a threatening figure. The character also spends a good amount of his screen time delivering exposition which certainly doesn’t help with the film’s odd pacing. Katherine Waterston reprises her role as Tina Goldstein, an Auror for the Magical Congress of the Unites States. Newt’s still deeply infatuated with the woman whose eyes remind him of a salamander’s, however a misunderstanding leads Tina to believe he’s moved on to another woman. The strong character’s reduced to jealous exe status for the first half of the movie which puts a damper on what chemistry does exist onscreen between Waterston and Redmayne. The first Fantastic Beasts set up the world of Newt Scamander and his friends. The second movie plays out like filler setting up a third, and hopefully much better, installment.